The savage continent of Tarakona, where draconic races battle for supremacy! 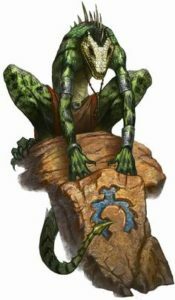 The fearsome, combative, plains-dwelling Kala people (think lizardfolk) send spellcasters into battle along with their warriors and archers. The kala warcaster is a ranged support fighter, corralling enemies with walls of force, churning up ground into difficult terrain, and blasting enemies that get too near. Because Tarakona is designed as a foreign, unexplored continent, the warcaster uses unique spells, outlined in its stat block. If you’re dropping the warcaster alone into your campaign, it livens up a battle with its unusual tactics. Spellcasting. The warcaster is a 4th-level spellcaster. Its spellcasting ability is Wisdom (spell save DC 12, +4 to hit with spell attacks). It casts from a non-standard spell list, so its standard combat spells are listed below. Blast of Overwhelming Force. Melee Spell Attack: +4 to hit, reach 10 ft., one target. Hit: 6 (1d8+2) force damage, and the target must make a DC 12 Consitution save or be pushed back 10 feet. Prayer of Blessed Healing. Up to 3 creatures the warcaster can see within 50 feet gain 2d4 temporary Hit Points. Perimeter of Total Defense. Concentration, up to 1 minute. The warcaster creates an invisible wall of force 10 feet high, 1 foot thick, and up to 30 feet long, which can turn 90 degrees every 5 feet as desired. The wall can be enclosed on itself. The wall has Armor Class 10 and 20 Hit Points. Corruption of Firm Ground. An area 30 feet wide shakes and crumbles, becoming difficult terrain. All creatures within the area are knocked prone and must make a DC 12 Dexterity saving throw or take 1d8 thunder damage. The warcaster uses corruption of firm ground on enemies as they approach, then perimeter to keep them away from allies (especially archers), switching to prayer if enough allies are damaged. If an enemy gets within melee range of the warcaster, it uses blast then moves 30 feet away.